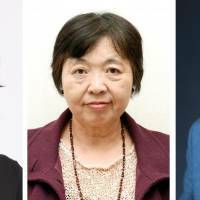 Novelists Chisako Wakatake and Yuka Ishii have won the prestigious Akutagawa Prize for up-and-coming authors, while Yoshinobu Kadoi won the Naoki Prize for popular fiction, the selection committee said Tuesday. At age 63, Wakatake is the second-oldest winner of the award after Natsuko Kuroda, who won the award in 2013 at age 75. Wakatake’s novel “Ora Ora de Hitori Igumo” (“Live By Myself”) deals with aging by depicting the life of a 74-year-old widow after losing her husband. It is written in both the local dialect of the Tohoku region — Wakatake is from Iwate Prefecture — and standard Japanese. In her debut work “Hyakunen Doro” (“100 Years Mud”), Ishii, 54, a Japanese-language teacher in Chennai, India, depicts the main character’s strange experience after a once-in-a-century flood. Kadoi, 46, who made his debut as a professional writer in 2003, won the Naoki Prize in his third nomination with “Gingatetsudo no Chichi” (“Father of the Galaxy Railroad”), which portrays the relationship between the Japanese poet and children’s book writer Kenji Miyazawa and his father. Candidates for the 158th Naoki Prize included Saori Fujisaki, 31, a member of popular Japanese band Sekai no Owari who wrote “Futago” (“Twins”). The awards will be presented at a ceremony in Tokyo in late February, with each winner receiving ¥1 million ($9,000) in prize money. The Akutagawa Prize was established in 1935 in memory of the Japanese novelist Ryunosuke Akutagawa. The Naoki Prize, also created in 1935, was named after author Sanjugo Naoki.